Trying to choose the right wire can be very confusing. Do I get solid core or stranded? What gauge do I get? Is the wire that comes with it okay? What is the difference between a 20mil coating and a 60mil coating? We are here to help here @ Pet Stuff Warehouse. With our 20+ years in the Dog Fence Business, we can help guide you in the right direction in choosing the right wire for you. 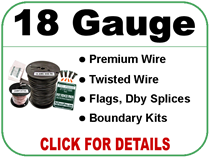 And we have a great selection of wire ranging from the wire that comes with the system to the 12 Gauge Extra Heavy Duty Professional Grade wire with a 60mil coating. We also have started carrying spools up to 5000 feet in most grades of wire. We carry the best products from Pet Fence Pros™.